Does your normally docile, friendly pet turn into the Tasmanian Devil the moment you pull into the veterinarian's parking lot? It's not unusual for pets to feel a little stressed by a visit to the vet. When your dog or cat is anxious or behaves aggressively, a simple checkup can become a difficult experience for both of you. Luckily, there are a few things you can do to help your pets handle the visits a little better. If your pet's carrier or crate only comes out when it's time to visit the vet, he or she may develop a negative association with it. As soon as the carrier makes an appearance, your pet might just decide to curl up under your bed or find another hiding place. The next time you schedule an appointment for your pet, immediately dust off the crate or carrier and place it in the family room or kitchen with the door open. Add a new toy or tempting treat to convince your dog or cat that the crate or carrier isn't such a bad place to spend a little time. 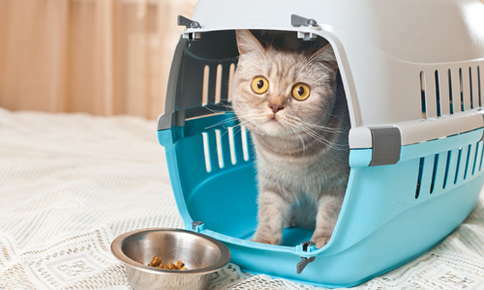 The more time your pet spends in the carrier, the less scary it may become. Pets may also associate your car or truck with veterinary visits if they only ride in your vehicle when they have an appointment. As soon as your dog or cat enters your vehicle, he or she may become fearful or anxious. When pets are already stressed before they even leave your driveway, just walking through the doors of the veterinary clinic can be overwhelming. You can help your dog or cat relax during car rides by taking him or her for short rides. The first time you go for a drive, you may only want to travel around the block. Gradually increasing the duration of these trips offers a simple way to help your pet adjust to riding in a car or truck. During one of your car rides, you might want to stop by the vet's office for a social call. When your pet realizes that a trip to the vet can be an enjoyable experience, he or she might not be quite so reluctant to get out of the car the next time you visit. Sit, sit and stay, down, come, leave it and other basic commands can help you remain in control of your dog during a visit to the veterinarian. If your pet doesn't know or respond to commands, set aside a little time every night to help him or her master these helpful commands, or enroll your dog in an obedience training course. Performing your own examinations on your pet allows you to identify any strange lumps or bumps and also helps your dog or cat adjust to being handled. Mimic the actions you've seen your pet's veterinarian perform, such as feeling the abdomen and paws and examining the ears and teeth so your pet becomes more accustomed to being touched all over their body. Pheromones, natural chemicals produced by the body, can calm your cat or dog and make him or her feel less anxious or fearful. Pheromone diffusers available in pet stores or online send a steady stream of the chemical into the air. For best results, plug in the diffuser an hour or two before your pet's veterinarian visit. Although pheromones aren't effective for every pet, they're worth a try if veterinary visits are difficult for your furry friend. Make sure you use a leash and a collar or harness when bringing larger dogs to the vet. In the event that another animal becomes aggressive toward your pet, you'll want to be able to quickly pull him or her back from potential trouble. Decreasing your pet's stress level will make veterinary visits a much more pleasant experience and help ensure that he or she receives needed care and screenings. If it's time for your pet's checkup, or you're concerned about a health issue, give us a call. Cesar’s Way: Did Somebody Say ‘V-E-T’?